The air conditioning only operates when the engine is running. it permits automatic and optimised adjustment of all of the functions, passenger compartment temperature, air flow, air distribution and air recirculation, in accordance with the comfort value that you have chosen. When the engine is cold, to prevent too great a distribution of cold air, the air flow will reach its optimum level gradually. On entering the vehicle, if the interior temperature is much colder or warmer than the comfort value, there is no need to change the value displayed in order to obtain the comfort required. 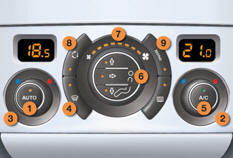 The system corrects the difference in temperature automatically and as quickly as possible. To switch it off, press the "visibility"
button again or press the "AUTO"
button, the indicator lamp in the button goes off and the indicator lamp in the "AUTO" button comes on. Turn control 2 or 3 to the left until "LO" is displayed or to the right until "HI" is displayed. Switching the system off could result in discomfort (humidity, condensation). Press this button again to return to automatic operation of the air conditioning. The indicator lamp in the "A/C" button comes on. Press this button for recirculation of the interior air. The indicator lamp in the button comes on. As soon as possible, press this button again to permit the intake of outside air and prevent the formation of condensation. The indicator lamp on the button switches off. Press this button to equalise the comfort value on the passenger's side with that on the driver's side (mono zone). The indicator lamp in the button comes on. This action switches off the air conditioning and the ventilation. Avoid prolonged operation in interior air recirculation mode or driving for long periods with the system off (risk of condensation and deterioration of the air quality).